Looking for a new East Bay location. 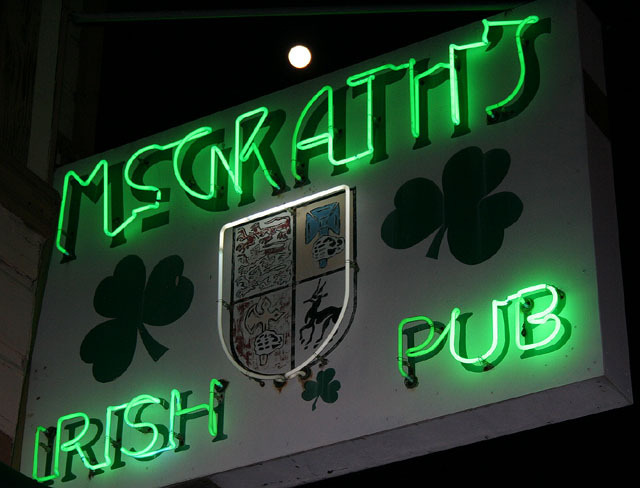 McGrath’s in Alameda, the leading supporter of live Bay Area roots music, is losing its lease in May 2011 and ending ten years at it’s current location. Owner Peter Barnato plans to relocate his labor of love elsewhere in the East Bay. 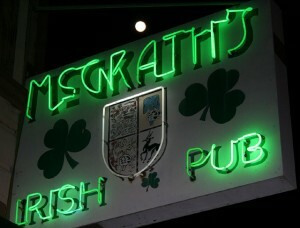 This could work out for the better since the current location is in a residential neighborhood and the club has always had to walk a tight line with live music… The Bay Area has lost an oxymoron as the Sacred Profanities are taking advantage of their recent reorganization and changing their name to Calafia. Sure it’s going from clever to bland but bland trumps clever when it comes to obtaining bookings. ‘Tis a pity there are so few who could, or would, get the joke… The B Stars‘ “Behind the Barn with The B Stars,” is their first fill length CD and the release party is yet to be scheduled but find them April 15th at the Hotel Utah. This will be a steel-lovin’ night with headliners Petunia and the Vipers out of Canada featuring members of the late Ray Condo‘s band, and the Hotst Totsy Hillbilly Jazzbos which is closer to 1920’s popular song than to jazz… The Hi-Rhythm Hustlers have been busy hustling their first CD as well. Look for reviews of both coming soon on Hicks with Sticks… Li’l Anne and the Tune Wranglers, which materialized out of the ashes of the Sweet ‘n’ Lo’s, will be breaking out of hibernation on April 29th for an early (6:00) show at El Rio sharing the bill with the Men of la Mancha which is the new Misisipi Mike band for Spring 2010… The Blue Macaw, former home of 12 Galaxies in SF, is making plans to start a monthly Thursday rockabilly, alt-country and C/W night… The Blue Diamond Fillups are also looking into starting a regular showcase to get more stage time for lesser known Bay Area roots bands. Whether the BDF’s and the Blue Macaw’s plans will merge is yet to be known, but the possibility is there. Sacramento and San Jose, both known as big cities with too few live music options, are looking to change that. Swing is the thing in Sactown where the Midtown Stomp has been hosting weekly live band and DJed dances with lessons. 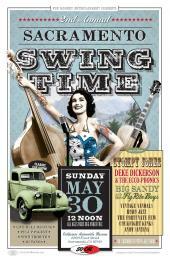 The town is also gearing up for the second annual Sacramento Swing Time event on May 30th with Stompy Jones, Deke Dickerson and Big Sandy. Rockabilly keeps putting down roots in San Jose. This Yelp page summarizes Saint Joe’s spots for music, clothes, hair, etc. ; and May 1st marks the kickoff night for Midnight Shift at Club Milano at 2nd & San Salvador where DJ Tom LG plans to spin vinyl every Saturday night. Mixed reports have filtered back from Midnight Shift, the new Saturday night DJed event at Club Milano in SJ. The $10 cover for a DJed event isn’t going to fly so it is now free to anyone arriving before 10:00. The after 10:00 price and the location in a former fancy restaurant instead of a dive bar still need re-thinking.